Over $155 off Top of the Line Excalibur Electric Food Dehydrator Today only on Amazon- Best Price! If you’re in the market for a dehydrator, the Excalibur is the best of the best! 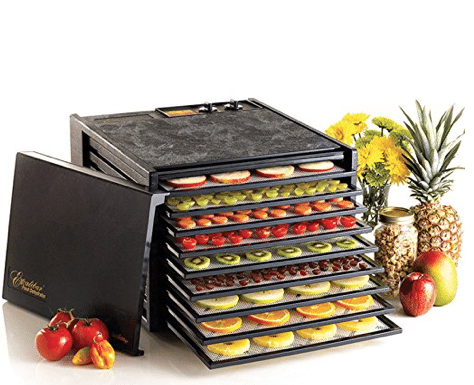 They rarely offer discounts on this super highly rated electric 9-tray food dehydrator so I’m excited to see Amazon has a huge price drop on it as Amazon’s Deal of the Day! This commercial grade dehydrator normally sells for $350, but today only, Amazon is offering it for just $191.99! Dehydrators have so many uses including making alternative flours, yogurt, dried fruit, dried herbs, fruit roll ups, dried veggies, jerky, raising bread and more! This is going to be a popular deal, so check it out here while it’s available. This deal ends at 2:59 am est or sooner if they sell out. Price is accurate at time of posting and could change at any time. We are a participant in the Amazon Services LLC Associates Program, an affiliate advertising program designed to provide a means for us to earn fees by linking to Amazon.com and affiliated sites.